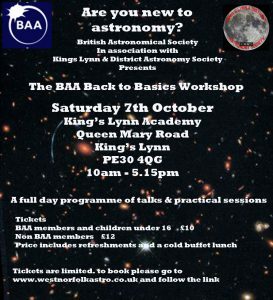 King’s Lynn and District Astronomy Society are pleased to announce that they will be co-hosting a Back to Basics Workshop in conjunction with the British Astronomical Association (BAA). Full details are in the poster below and on the BAA website. I have updated the Events Calendar with all the latest up coming Talks and Events. As more events are confirmed I will add them in the next coming months. We have a few guest speakers lined up for you this coming year and more to confirm! UPDATE: A Fantastic talk by Dr Carolin Crawford was enjoyed by all. We look forward to your next visit to KLADAS next year! Thank you so much! (Please view our events page for more info on location)We are proud to host Dr Carolin Crawford who returns once again to amaze and delight our Astronomical thirst for knowledge of the beauty and science of Astronomy and Space. This talk is about interstellar space – not truly a vacuum devoid of matter, but inhabited by vast thin clouds of gas and dust that appear as glorious and complex structures. 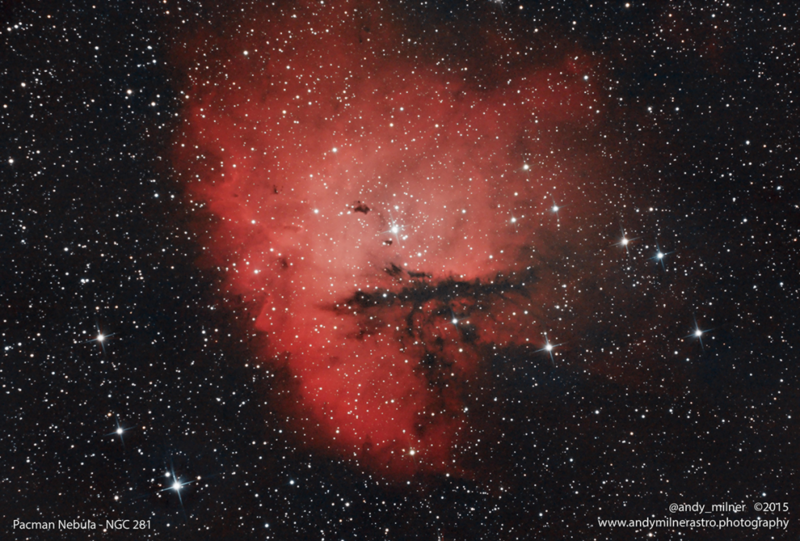 Dr Carolin Crawford will showcase some of the most spectacular images of these ‘nebulae’, including many taken with the Hubble and Spitzer space telescopes. She will lead us to look at them with new eyes, deconstructing the pictures and learning how to ‘read’ what they tell us about the turbulent story of the birth and death of stars. Indeed, revealing the science behind the beauty. Outreach Officer at the Institute of Astronomy and Fellow of Emmanuel College, University of Cambridge, Professor Carolin Crawford is one of Britain’s foremost science communicators. would like to join the Society. This Event has now passed, and what a fantastic Solar Transit it was! KLADAS will keep you updated on the next major astronomical events. All members will be kept up to date by email with a monthly round up of what to see in the sky. share a rare astronomical event. happened so far this century! active the Sun’s outer layers are. So come and join us for what promises to be a great spectacle. or a telescope as it will result in almost certain permanent blindness. 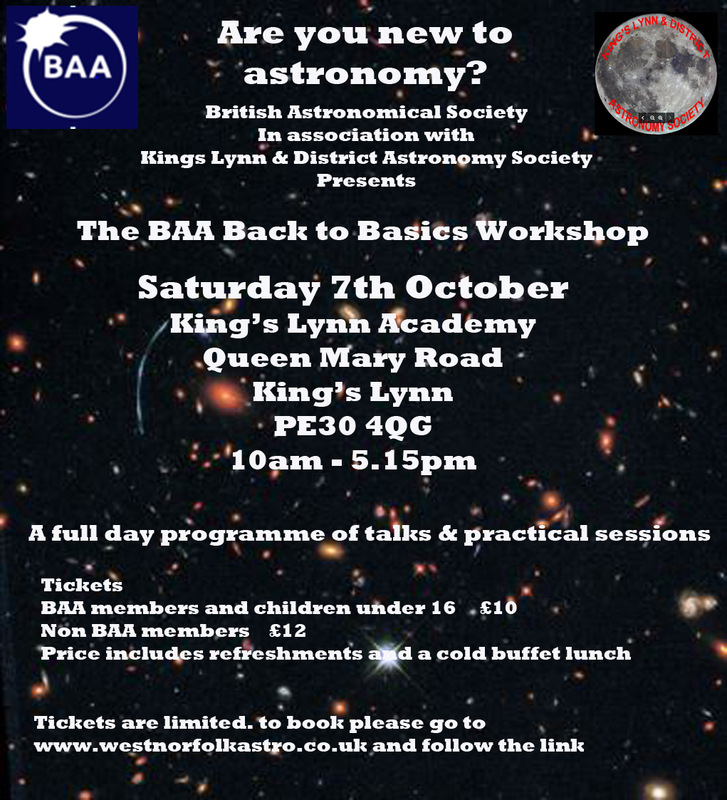 This Monday we have the pleasure of guest speaker Paul Fellows from the Cambridge Astronomical Association giving us a talk. Fire and Ice: The Volcanic worlds of the Solar System. More details on our Events Calendar. Wednesday 03/02/2016 saw the Society back at RSPB Titchwell for another outreach event organised by our hosts. The paying members of the RSPB were treated to a guided tour of the hides at Titchwell and also some sites of very rare birds. 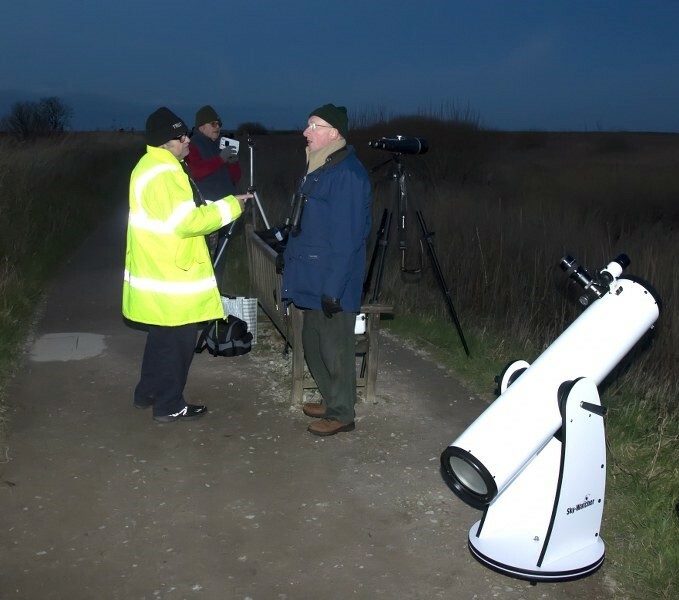 Once they had finished with that part of the evening they headed back along the path to join us with our scopes and binos for a tour around the night sky. John had previously given them all a brief talk on what that would see with us. To our great fortune the weather was on our side and we had a wonderful clear sky to show them. Orion was absolutely beautiful as was the rest of the night sky. Once we had set all the scopes and binos out along what is a narrow little pathway we were ready to great our guest for the evening. Richard, Terry and Alan were on hand to give a great narrative on what everyone was looking at. We had several very good questions fired at us during the session and everyone seemed very pleased with our explanations of the night sky and constellations. But unfortunately the sky turned against us and quite quickly covered itself up in a large blanket of cloud which was very disappointing. But at least everyone had had a good view. Just after everyone had left the cloud shifted out of the way and we had nice clear sky again. So John and I stayed on for a bit longer but eventually the cold got to our old bones so we also packed up and headed homeward. But we all had a very good evening at such a lovely dark sky site and we all will look forward to our next visit to RSPB Titchwell and the very welcoming staff and volunteers who work there. 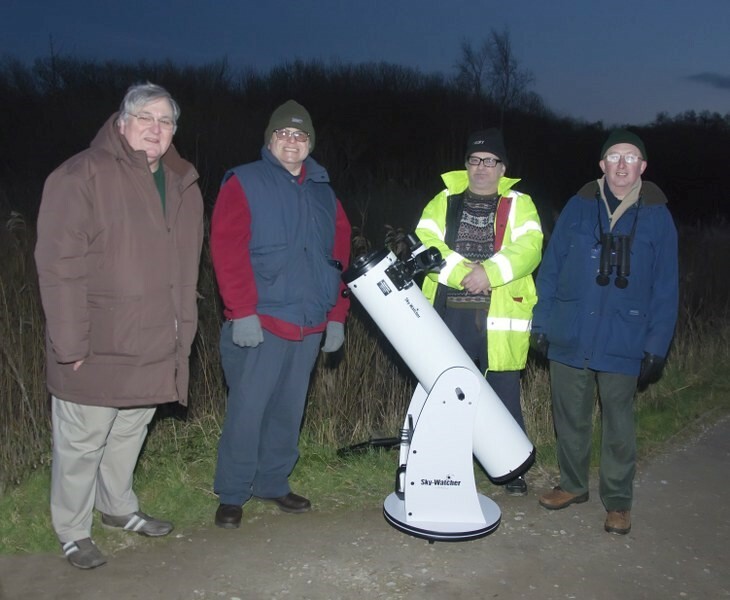 ASTRONOMY SOCIETY STARGAZING LIVE EVENT A SUCCESS! 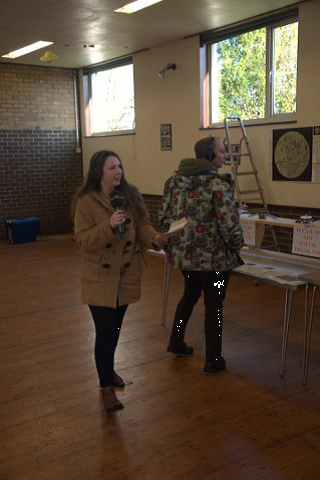 Well our Stargazing Live event got off to a good start as we played host to Radio Norfolk’s Treasure Hunt on Sunday 17/01/2016. John managed to hide the clue on the International Space Station, alright our model of it!! After some thinking on the acquired clue they finally jumped back in their car and sped off over the horizon. Would just like to say a huge thank you to all of you boys and girls who helped us out during the day. The grand opening took place at 2pm by the King’s Lynn Deputy Mayor and Mayoress Cllr David and Mrs Linda Whitby and Downham Market Mayor and Mayoress Cllr John and Mrs Margaret Fox. 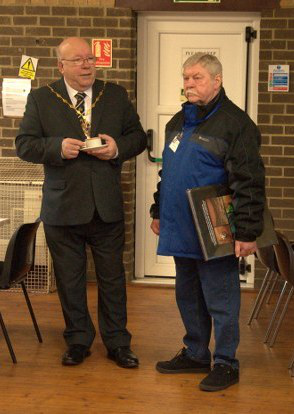 As always we were well supported by the local dignitaries. They made short work of our tea and biscuits!! 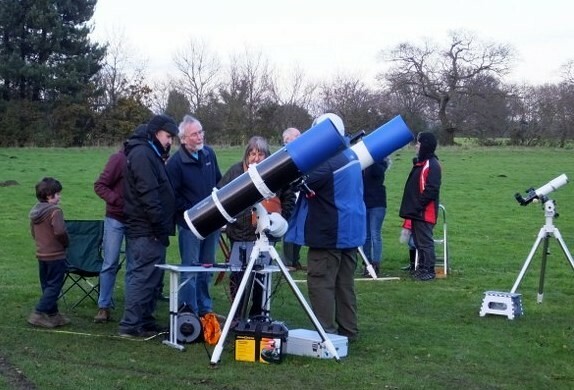 As always we had a good sortment of scopes and binos in the field next to the hall and due to the moons current phase we were able to show the public the moon by daylight. The sun occasionally came out for those with the relevant filters. But as usual the good old British weather let us down in the evening with plenty of low cloud, hey ho getting used to it now. We had nearly 200 people through the doors though, so a very reasonable turn out. They came in a steady flow all day so we weren’t rushed off our feet and had time to answer questions and help a few with their scopes. A good selection of displays inside with the usual colouring for the kiddies. Had some scopes inside too with software and videos running on our laptops. As always Dave Coombes did a marvellous job in the kitchen looking after us members as well as the public. So all in all a really good day enjoyed by everyone. Looking forward to next year’s now. Outreach to The Marshland Society. Monday 11/01/2016 found us giving a talk, display and obs session to the Marshland Society It was a very good turnout approx 40-45 people. Our Chariman John Craythorne’s talk went down very well with a nice little Q & A session afterwards. 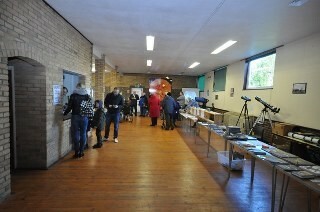 They were very impressed with our telescope and binocular display and came for a good look around after the talk. We were very lucky too, as the sky cleared for a brief time so we were able to show them the constellations and let them have a look at the Orion Nebula which they were well impressed with. So it all went off very well and I think we may get asked back in the future as seems to be the normal now. It’s back again for the fourth year. King’s Lynn and District Astronomy Society will be presenting our own Star Gazing Live event at Tottenhill Village Hall Whin Common Road post code PE33 0RS on Sunday 17th January 2016. The theme this year will be the Exploration of Space and will include various models of spacecraft over the past 60 years with information of many space missions together with images and videos of the missions. As always there will be a variety of telescopes and binoculars available for you to look through if the sky is clear. A children’s corner with colouring and constellation chart making together with games. Refreshments will also be available including hot and cold drinks and a burger van. Well it’s almost here folks! After our previous successful event with around 260 visitors, we expect possibly even bigger crowds this time with darker skies in November. 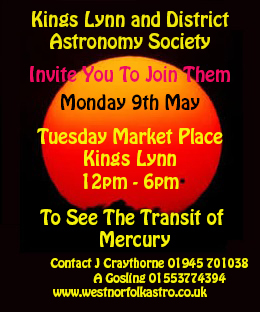 Subject to weather conditions we will have a variety of telescopes on display with our members own telescopes being demonstrated. Please keep your fingers crossed for the weather! 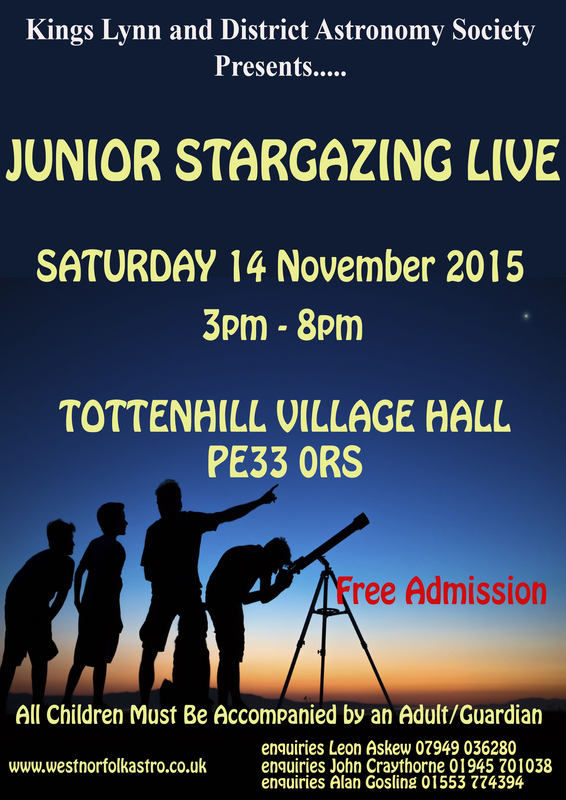 A Tombola and crafting and colouring will be available to younger visitors to learn about Space and Astronomy. 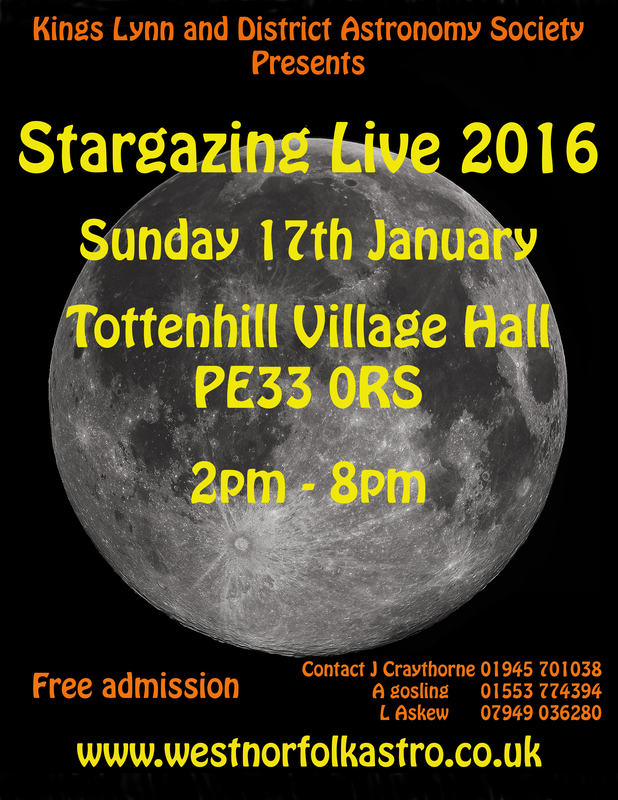 Also information and videos and astrophotography on display to view. A refreshments fast food van will be onsite and we will be offering Tea and Coffee.